There are so many things on our to-do lists everyday wouldn’t it be nice to remove a few unnecessary gardening chores permanently? While there is no such thing as a no maintenance landscape we can certainly have a low maintenance one by eliminating steps that are not only not needed but in some cases can cause more harm than good to our landsca pes. Weeding-pulling weeds causes soil disturbance which leads to seed disturbance and promotes more weeds. While we certainly don’t want our gardens taken over by weeds, consider trimming the weeds off at the soil level rather than ripping out the whole plant. I have found a tool that works well for this—a Garden Hoe. 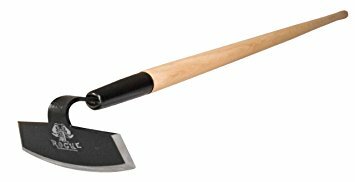 It has along handle with a sharp edge at the bottom of a triangular piece that, when you swipe it across the weed cuts it off at the soil level and provides for minimal soil disturbance. It may sound like a chore but in the long run you will reduce the amount of weeds that are coming up by not digging into the seed bank. Use a Green Mulch layer-this is another great way to reduce the amount of weeds that show up thereby reducing the amount of weeding that needs to be done. By using plants as “mulch” you will have a nice layer of green to keep the weeds at bay. Some of my favorites are Packera Aura Golden Ragwort, Chrysogonum virginianum Green and Gold, Antennaria Pussytoes, and Salvia lyrata Lyreleaf Sage. There are always many native grasses that would work in this layer. Plant them closer together than any plant tag will tell you to do-about 10-12” so they grow together quicker a form a protective green mulch in your gardens to crowd out weeds. Skip the Spring Clean-up-it is perfectly fine to leave the garden a “little messy” and begin to re-think pretty (did you read the March article “Re-Think Pretty”). The later in spring you can wait to cut last year’s stalks (because remember we leave the stalks standing for overwintering pollinators) the more beneficial those stems are. When you do begin to cut them back leave 12-18” standing: the plants will grow and hide the stalks but the beneficial bugs will still benefit from this messiness. Try to leave the cuttings in place, let them lie in the garden as a natural “fertilizer’ and provide the plants with much needed nutrients; many song birds will also forage in the messiness. conditions the plant requires, as well as how big will it grow in its ideal conditions. Be sure to consult reliable online sites for more detailed information than a plant tag tells you. Instead of wasting time and money getting your soil amended to the conditions required for a plant, buy plants that fit the conditions you already have. Many native plants actually thrive in “poor” soil conditions and will get leggy and flop if they are in “rich’ soil. Asclepsis sp. Milkweed is the perfect example of this. Your rocky, sandy, clay soil does not have to be amended with tons of topsoil and compost to make the soil more plantable. Plants can have deep roots that grow beyond the soil you have amended and they eventually reach the native soil and don’t know what to do. Use a soil test to see what type of soil you have so you can match the right plant to that place , but don’t spend money or time on fertilizers to keep an unhappy plant in that place, remove it and find one that likes the spot as is! Finding the native plants that thrive in the soil you have and you will save time and money.